The Multi Packer places rings on the sides of bottles and cans. 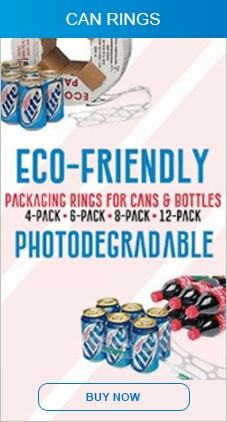 It is perfect for 8 and 12 pack cans and 6 pack plastic bottles. The Hand Packer makes 6, 8, or 12 packing easy! 1. Place ring carrier on the jaws. 2. Squeeze the trigger a few times to open the rings. 3. Insert bottles into the rings. 4. Lift out your multi pack. The Hand Packer will accommodate most any 12 to 24 oz. containers. See our wide selection of ring carriers or call us at (800) 446-7225 to discuss your application. Attention Store Operators: The hand packer is great for making 6 packs of bottles or 8 & 12 packs of cans. It is light and compact so you can put it where you need. Attention Bottlers & Distributors: The Hand Packer weighs only 9 pounds. Your drivers can take it on their routes. Click here to see a movie of 6 Pack bottle packing with the Hand Packer. Click here to see a movie of 12 Pack can packing with the Hand Packer. Are you planning to do more than 100 packs per day? If so, Mumm Products recommends Multi Packer for these higher volumes. Click here. Very useful product. Built well, excellent finish and quality. This packer machine is great for making 6 packs of bottles or 8 & 12 packs of cans. Great for my six pack side lift bottle packaging.